To some it might sound like divine intervention that the members of St8 of Grace came to be a band. But anyone who listens to the music created by the Chicago-based rock group will quickly see that they were destined to perform with each other. In a recent conference call lead vocalist and guitar player Lemoyne Alexander (aka L.A.), bassist and vocalist Ben Sticklen and guitarist Dave Moreno talked about how the band they formed with keyboardist Rio Colone and drummer Parker Slade. As Sticklen recounted, "L.A. actually came in as a producer to produce a project that I was working on called Black Thumb. They were a heavier rock band and that project ended up that the pieces didn't work out… So L.A. pulled me aside and said, 'I really like your ethic and I think we could make some good songs together if we put our two heads together. He went and got a guy and I got a guy, and we started writing our first album. And that's how it started." Alexander also discovered Moreno in an unusual way. St8 of Grace's guitar player reflected on the fateful encounter, "I had actually only been playing the guitar for about six months when I meet L.A. Some things happened with the original members that caused almost half of the band to leave. He saw me playing at Guitar Center on a keyboard and asked me if I played guitar. I showed my bluff and he bid on it. And he actually ended up teaching me a lot of what I know today. But I'm happy to say that I can really play that thing now." The band released their first CD, Immune, in 2010. But as L.A. recalled, "We did the first album based on our feelings and emotions and telling stories. When we went out to perform it and do shows, people kind of geared us like, 'Oh, these guys are too soft. They're not a real rock band.'" So when it came time to record the follow-up, Hereafter, L.A. explained, "That challenged me to say, 'Okay, I know we can do rock.' And so I wanted to experiment on Hereafter with a harder edge then the first album." Luckily the band had a deep cache of musical inspiration to draw from in moving in a new direction. The members cite an eclectic array of influences from Godsmack to Jason Aldean, Pearl Jam to Primus and Lenny Kravitz to Linkin' Park. As for their own style, Ben described it as "a mixture of Coldplay, Nickleback, Chilli Peppers, maybe even some Linkin' Park. It's a melting pot mixture of all different kinds of styles that's enjoyable music for every age and every genre — old, young, black, white, female, male." As a result, they've found a loyal following of fans who can relate their music. As L.A. noted, "Our songs really depict some of the emotional situations and the things that people are going through in the world." The band tackles topics as varied as the financial troubles and foreclosures, Internet dating and faith in God. As Ben remarked, "We like to be pretty direct about the message of our songs rather than be abstract and try to have a subliminal message. We like to give it straightforward." If all that wasn’t enough of a draw, "Hereafter," features a once-in-a-lifetime duet with a long since gone rock icon — Freddy Mercury. "Freddy Mercury wasn't there," joked L.A., "but we were able to get the actual recording session files [for 'Killer Queen'] from the record company and they wanted to see what we could do with them. We pretty much just put both records together and I sang the lead and Freddy Mercury did all of the background. We put our guitar parts in with their guitar parts and their drum parts and we made a duet out of it." 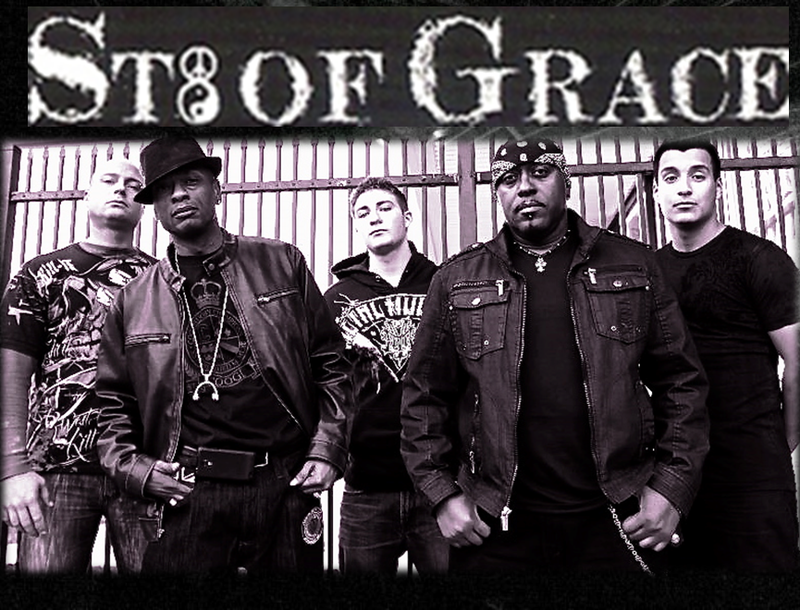 For more about St8 of Grace, their new CD Hereafter and their upcoming documentary Anatomy of a Rock Band, or for bookings call 301.441.8899 or visit the website www.entertainmentdc.com.